The Newark School of the Arts celebrated it's 50th anniversary with a gala at NJPAC. The chorus was conducted by Beatriz DeMello (pictured). She is a teacher of piano and voice at The Cortlandt School of Performing Arts, Croton on Hudson, NY. CSPA private saxophone student, Ronica Illonardo, had the honor of participating in the 2018 WCSMA Intermediate All-County Band. She says "it was a wonderful experience to play with other accomplished musicians within Westchester and to collaborate with them to create a magnificent concert at SUNY Purchase College. For me to be accepted to play in this band I had to show hard work and dedication in my NYSSMA audition last year. I had to persevere and show that I had the capability of being a strong musician. With that being said, I couldn't have done it without the guidance of my amazing and talented saxophone teacher, Steven Frieder." She thanks Mr. Frieder for helping her every step of the way. CONGRATULATIONS to Ronica Illonardo AND Steven Frieder. They are a great team!! 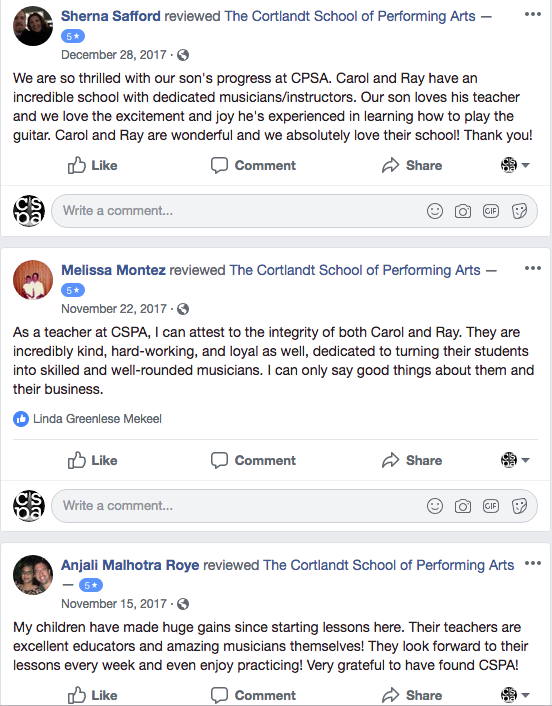 The Cortlandt School of Performing Arts offers outside performance opportunities for their vocalists and this year our teens will enjoy performing at Paramount Hudson Valley with Jessica Lynn. [Click here for ticket info] Our last public performance was a show at The BeanRunner Cafe in Peekskill as a summer finale, where our teens sang a multitude of Broadway, pop and rock favorites with a live professional band, culminating with a tribute to 50 years of Sgt. Pepper, in a 30 minute medley. The choral music for Jessica Lynn will be arranged and rehearsed by Carol Arrucci, owner and voice teacher at CSPA. The teens are looking forward to this experience of singing in this beautiful theater and are honored to be invited back. In addition, these same students will be preparing for the January and spring recital and most will participate in NYSSMA Adjudication.